Congress may be on summer break, but we are not backing off. Not when the fate of over a million immigrants and refugees continues to hang in the balance. That’s why we’re calling on YOU to use the congressional August lull to push even harder for the rights of these members of our communities. Passing a permanent solution for the hundreds of thousands of Temporary Protected Status (TPS) beneficiaries and the over 800,000 Dreamers. Ensuring all families separated at our border are reunited and preventing them and others from being held in prolonged detention. Rejecting funding for a huge increase of detention beds, expansion of deportation forces, and the infamous border wall. There’s plenty to bring up with your representatives and only a couple weeks to do it! The House Appropriations Committee just passed FY19 funding for the Department of Homeland Security (DHS). And it’s generous in all the wrong ways—$5 billion for the border wall, 375 more CBP officers, 400 new ICE officers, and 44,000 detention beds. We don’t know yet when this bill well get taken up for a vote. But we do know that we need to keep pressuring. TELL your representative and senators to vote against increased border militarization, deportation forces, and detention of families. Together, we’ve already worked hard to halt family separation, but there’s a long way to go. Last Thursday was the court-ordered deadline to reunify the over 2,600 children separated from their parent under the zero-tolerance policy. That deadline was not met. And while the administration keeps scrambling to reunite the remaining families, they’re also looking to their next cruel objective—dismantling the Flores v. Reno court ruling that prevents prolonged child detention. That’s right: some in Congress are in the process of introducing bills that would allow indefinite detention of children. But what they should really be doing is supporting cost-effective and humane alternatives to detention. 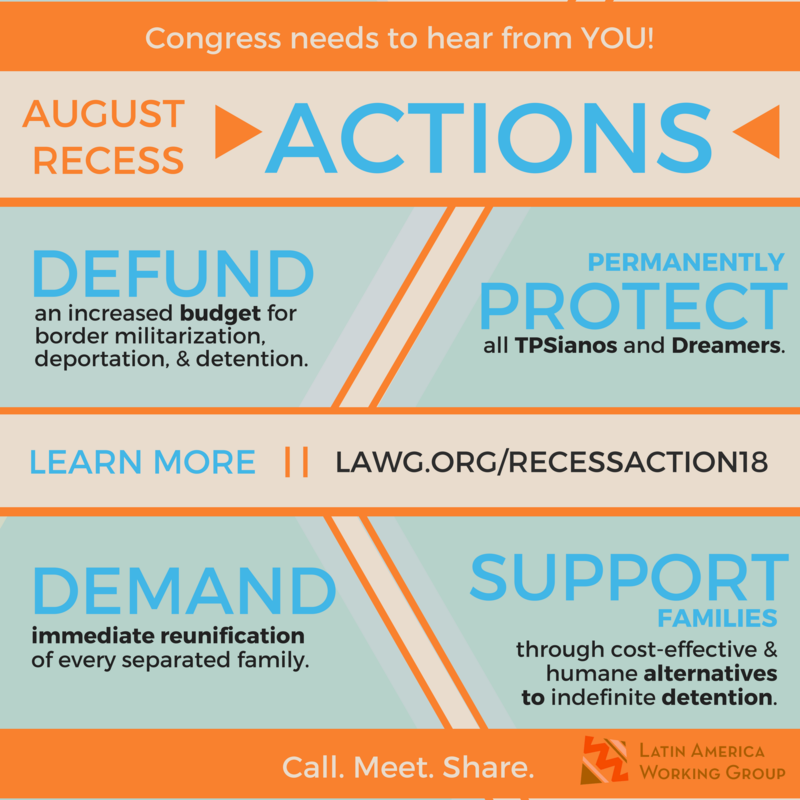 TELL your representative and senators to oppose any bill that would reverse Flores v. Reno and expand family detention. Children belong in safe communities with their parents, not locked up together in detention. And, make sure they keep pressure on the administration to immediately reunite separated families. Termination of the programs with no lasting solution has left both DACA (Deferred Action for Childhood Arrivals) recipients and TPS (Temporary Protected Status) beneficiaries in limbo. Some members of Congress insist on holding Dreamers hostage—refusing to pass the protection they deserve without increased border spending. Yet we know human lives are not a bargaining chip. Some members also claim TPSianos are “temporary.” But 20 years living, working, and contributing to the U.S. is anything but. TELL your representatives and senators to support bills that give these long-standing members of our communities the protection and recognition they need (and deserve) to stay in the U.S. Congress should pass the American Promise Act (HR 4253) and SECURE Act (S2144) for TPS holders and a clean Dream Act 2017 (HR 3440 and S 1615) for Dreamers. Just last month, Attorney General Jeff sessions single-handedly announced that gang-related, domestic, and gender-based violence are no longer eligible grounds for seeking asylum. This decision will make it a lot harder for Central American families, children, and individuals fleeing this kind of violence to access protection. That’s why Representatives McGovern, Pocan, DeLauro, and Torres just began circulating a dear colleague letter asking Sessions to reverse his decision to narrow the ways in which individuals can qualify for asylum. TELL your representative to support asylum seekers and sign the letter before September 7th. They should contact one of the offices listed above.